The Seattle City Council is poised to pass some legislation that would crack down on popular ridesharing services like Lyft and UberX. In an apparent attempt to protect the city’s taxi industry, the new rules would limit ridesharing companies to 100 drivers and limit driver hours to 16 per week. Lyft officials have said it could force them out of business. Outdated business models are the reason disruptive technologies come into being, and the taxi industry is no exception. Simply put, taxi companies offer an inferior service at a similar price to companies like Lyft and UberX, and have been unwilling to adopt basic, 21st century innovations like online reservations and real-time arrival info. Instead, taxi customers must call a dispatcher, wait on hold, and then wait some more (“10 to 15 minutes” is a typical estimate, but its accuracy depends on whether there’s actually a cab nearby and whether the dispatched cab shows up or decides to pick up another fare) before the cab arrives. People like ridesharing because it’s convenient, because it’s usually cheaper than taking a cab, and because they’re fed up with lousy taxi service. (Not one person who has testified at the many council meetings on this issue so far has claimed about the quality or safety of ridesharing services. The same cannot be said of cab companies.) So why is the city trying to put them out of business? Elsewhere on the Network today: The Wash Cycle writes that some DC churches are opposing a bike lane on 6th Street to preserve free parking. The Chicago Bicycle Advocate says that safety efforts encouraging the use of bike helmets become harmful when they suggest people without helmets are irresponsible. And the Architect’s Newspaper describes San Diego’s plans to overcome the barriers to Balboa Park created by a highway. It's been a bad few weeks for Uber, with CEO Travis Kalanick recently caught on tape in a shouting match with a driver over the company's diminishing pay. 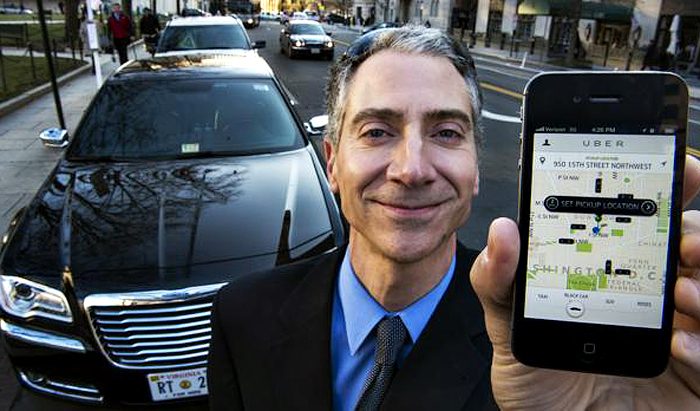 Joe Cortright at City Observatory says that beyond the public meltdown, there are a growing number of signs that Uber's business model just isn't sustainable.